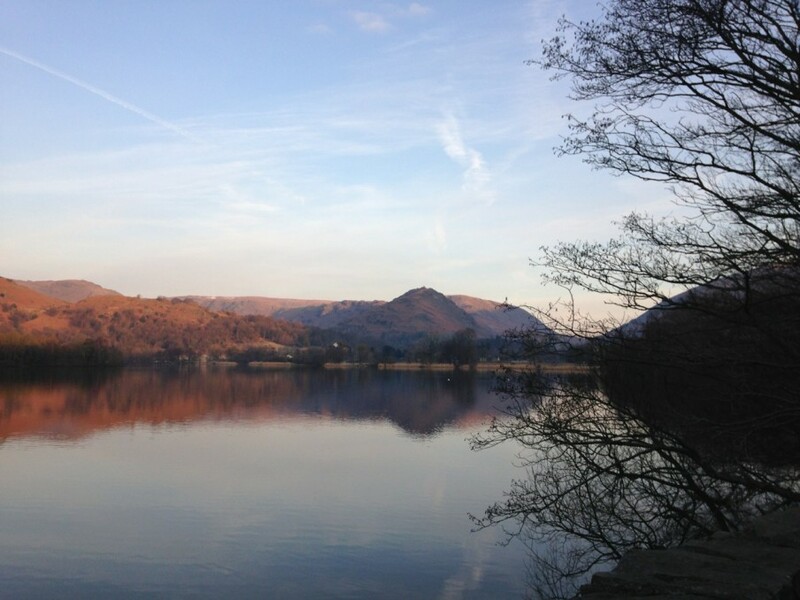 It took an age to get to Grasmere. I kept on having to stop and get out to take photos of the sunrise, the sky lit up red, not a breath of wind on the lakes. My pack was reassuringly heavy as I jogged up the verge by the deserted road to Dunmail Raise. today I’d remembered my micro spikes. I took a vertical line up Seat Sandal, marvelling at the changing view, the sun casting shadows on the surrounding snow capped peaks. It was going to be an amazing morning and I was going to make the most of it. 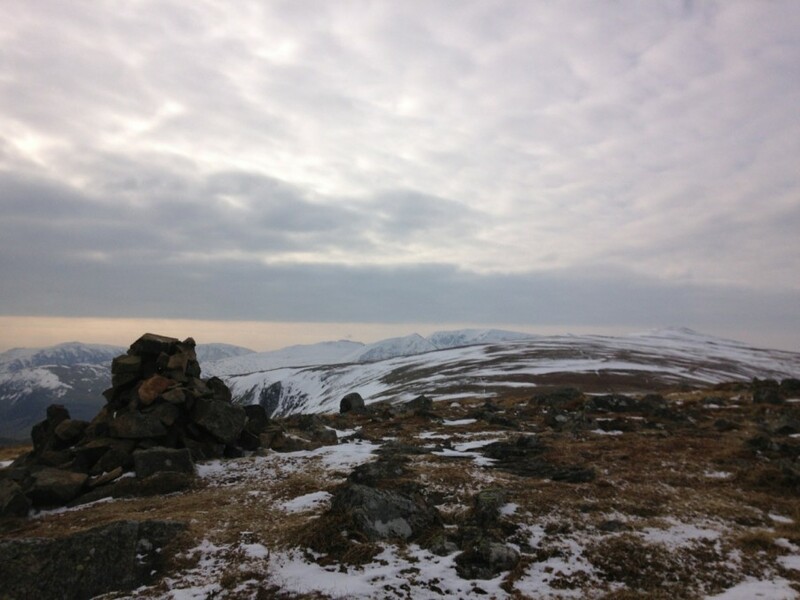 Hard snow patches surrounded the rocky summit cairn. I headed north east, knowing this was where any lingering snow would be. Micro spikes are a great invention, although they probably encourage people like me to take more unnecessary risk. I was looking for a steep snow slope to have some fun, and came up trumps. A ribbon of white dropped down towards frozen Grisedale Tarn. My technique is simply to lean forward and take big strides and go as fast as possible, making a lot of whooping noise. Absolutely exhilarating, especially at this early hour with no one else around. Climbing the steep, frozen, grassy slope of Dollywagon Pike, I made it more difficult for myself by stopping to take photos every few minutes. The views were stunning. 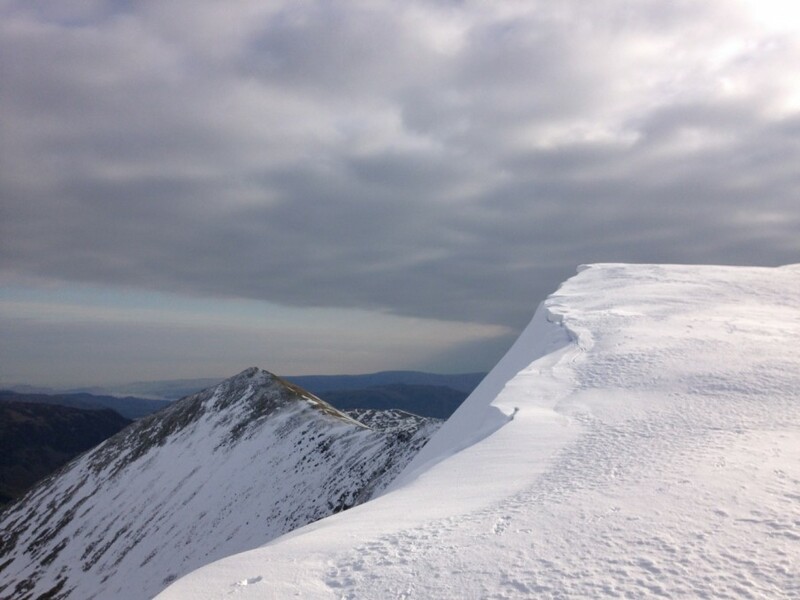 At the top, a huge spectacular cornice meandered it’s way to Helvellyn in the distance. 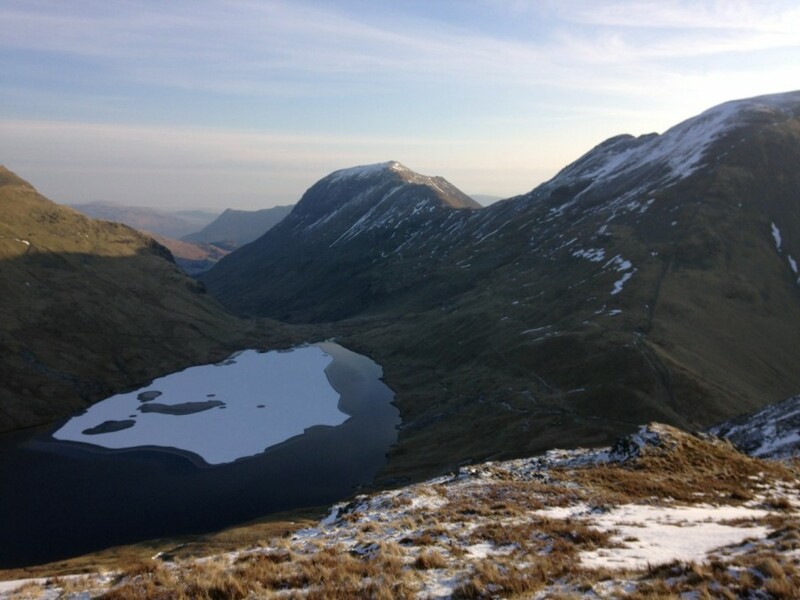 I ran along the ridge, over Nethermost Pike and soon I was standing at the summit cairn, marvelling at the criss crosses of ice on Red Tarn way down below. I was going well and my ankle was holding up, so decided to extend my planned run and make the most of the good weather and being up so high. Dark cloud was building up in the east, and the wind seemed to be getting a bit stronger, or maybe it was just more exposed here. The next three summits were a roller coaster of joy. 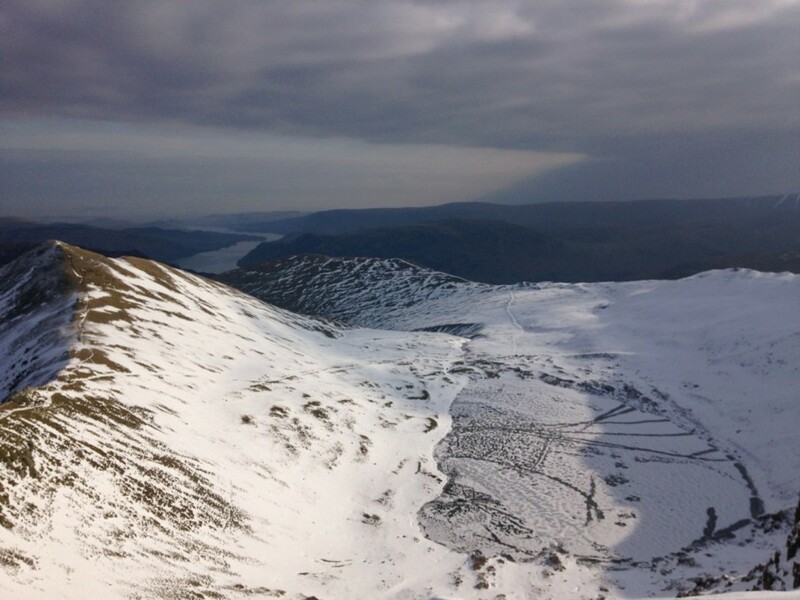 Hard snow with patchy ice in the shade on the way down, then frozen grassy ground in the sunshine on the way up. 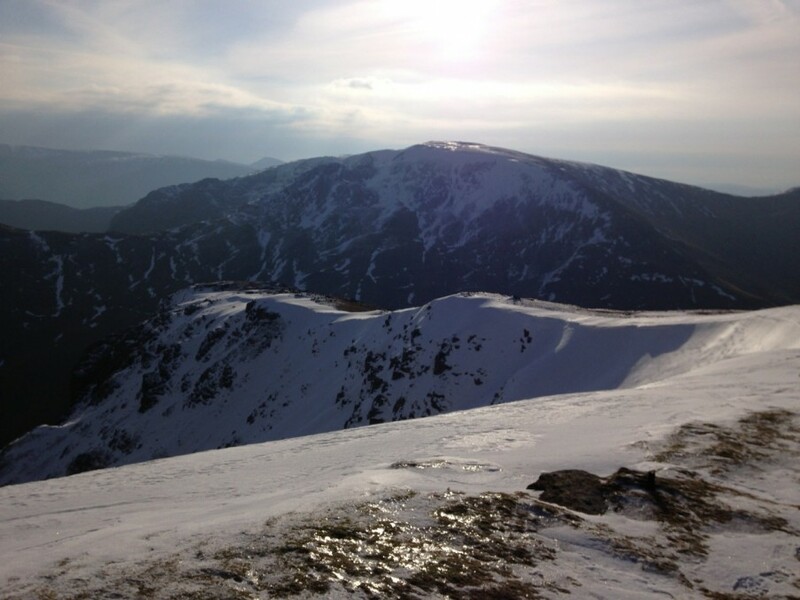 I’d taken the spikes off after Seat Sandal, and enjoyed the skittering and sliding in my studs on some of the snowy sections. 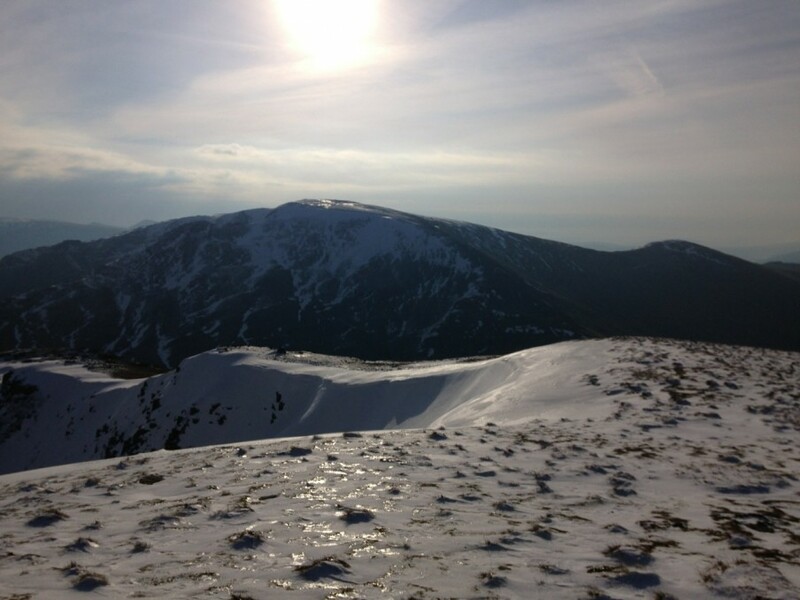 In quick succession, I ticked off White Side, Raise, then Stybarrow Dodd. The ski tow on Raise was working, although I could only see two people using the slope, then again, it’s still quite early in the morning, especially as the skiers need to hike in to use this particular ski resort. Wainwright must have had some time to kill when he included the next summit, Hart Side. 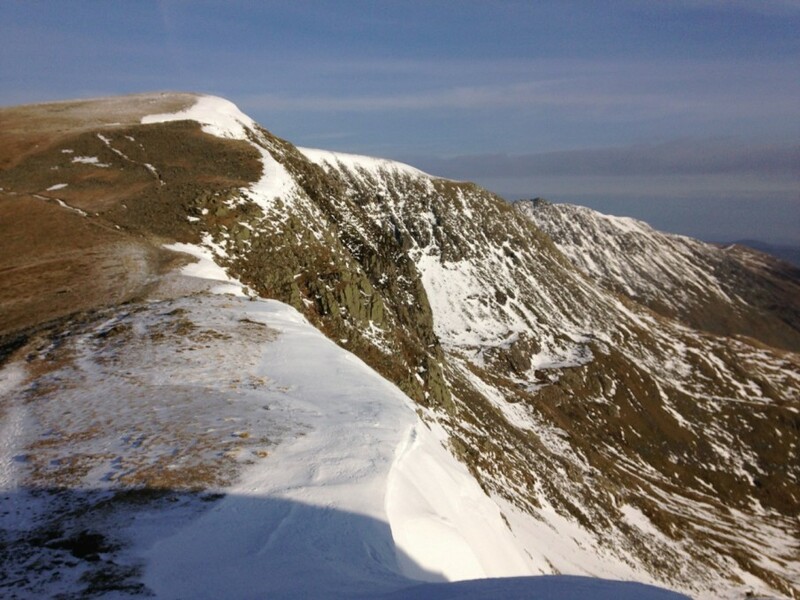 It’s some way off the main Helvellyn ridge, although an easy run on a well defined trod around the steep upper reaches of Deep Dale. 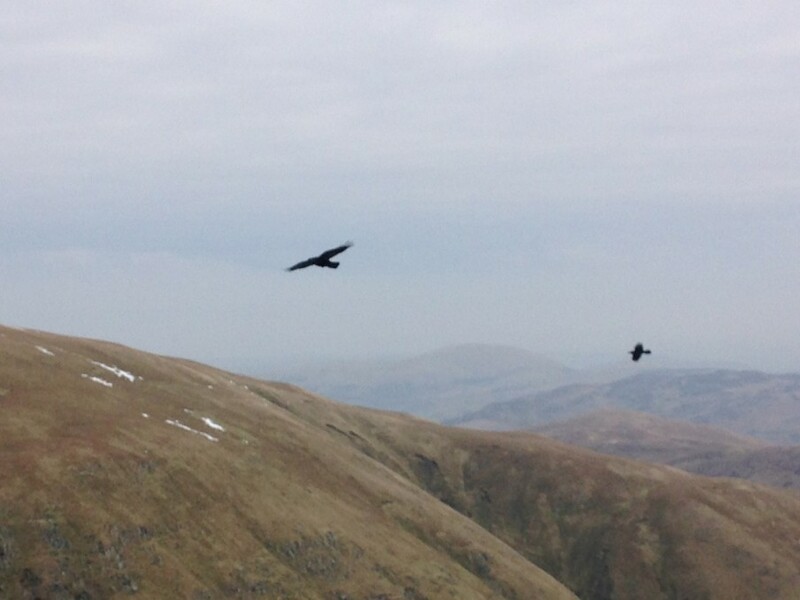 Further on, contouring round Green Side, a pair of Ravens were waiting for me on a rocky outcrop, as though willing me to take their photo. They gave me a deep croak as a pre flight warning and took off, tumbling in the air like show offs, even coming back for another fly past. This is most likely their territory. They probably have eggs in a nest on one of the nearby crags, and I remember they’re one of our earliest nesting birds. Their eggs hatch just in time to feed their young the protein rich afterbirth from new born lambs. Sheffield Pike is one of my favourite hills. The views towards Ullswater and back to Helvellyn are sensational, although it’s the ridge line I love the most. The narrow path winds down steeply through the heather inviting you to hop around tight cambers and skip over rocks, a balancing act between watching where you’re putting your feet and getting in a quick glance at the views. 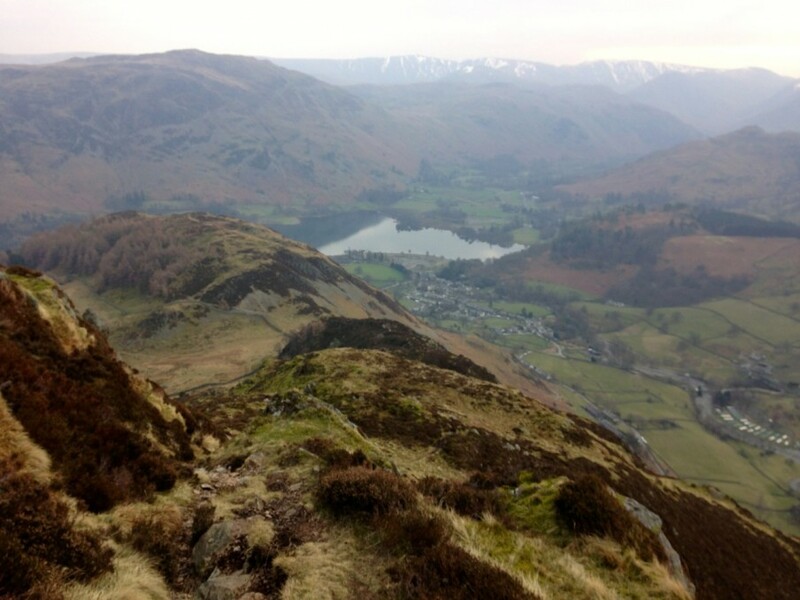 Finally Glenridding Dodd really is a doddle when you’ve made this descent, being a short climb through heather to the summit cairn, perched on the edge of the ridge overlooking the lake. Max the van was waiting in the main car park of Glenridding village, where I’d left it two days ago. I changed into my freezing cold, spare clothes and drove back to Kendal for a well deserved lunch. 10 Wainwright summits today, that’s 47 down, 167 to go. 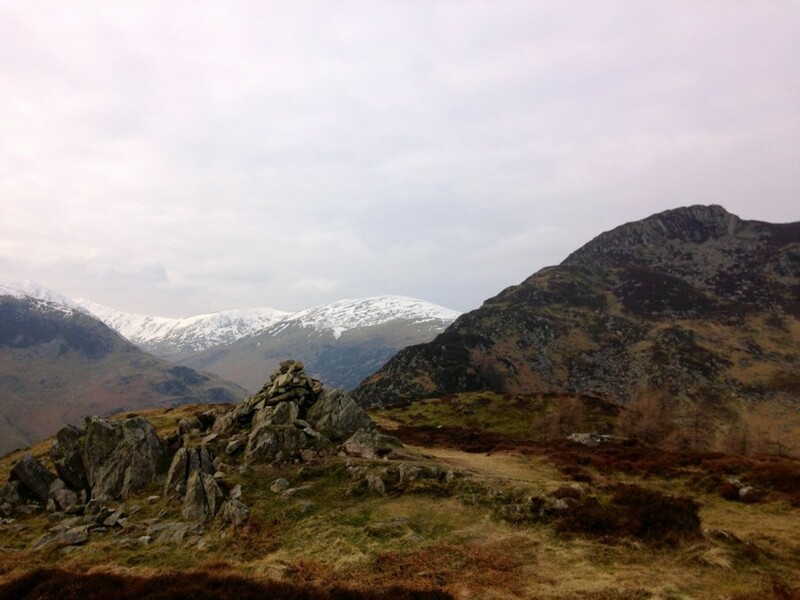 This entry was posted in Best Of, Blog and tagged bagging, Lake District, Lakeland Trails, run, running, summit, trail, trail running, trails, ultra, ultra run, Wainwright. Bookmark the permalink.